It feels like as soon as Georgia was born time decided to speed up even faster than it seemed to be going while I was pregnant. The days have absolutely flown by and I know my maternity leave will be up soon and life will again be changing in a big way. Georgia's first week of life was somewhat of a blur. We spent 2 days with her in the hospital and then came home only to have Joe going back to work the next day. I never thought just sitting around at home for hours on end and doing absolutely nothing but nursing and watching Friends reruns could go by so fast. Our little perfect peach is a month old already! She is seriously such a great baby. We have certainly had some rough nights, but for the most part she sleeps great, wakes herself at night when she's ready to eat, loves being walked around the house, & loves her rock n play. Her daddy is smitten with her and does a great job of caring for her and helping take some of the work off of me when he can. She just started to take a bottle and eats like a champ. We've taken her on a couple of outings and everyone compliments how beautiful she is. We had some family photos taken this past weekend and I cannot wait to see them. Afterwards we took her to lunch at Uptown where of course, she decided she was hungry at the same time mom ordered a glass of wine. I've had to nurse her twice now at restaurants, but no one seems to mind. I also took her to August Hill with my mom and my friend Jessica to visit. All of the employees were so excited to meet her. I carried her around in my Solly wrap and she slept the entire time. Our breastfeeding journey is going really well. Although it's demanding and a lot of work, it's been some of my favorite moments. I can soak every detail of her in while she's nursing; her little hands, usually kind of cold on my skin, I just love how she grabs onto my side or my finger or my shirt. Her little lashes and eyebrows, they're so fair. And that hair that she's actually managed to keep! I love to look at her skinny legs and narrow feet, usually lifeless when she's nursing, although sometimes tense and stretched out. She's seriously the greatest. 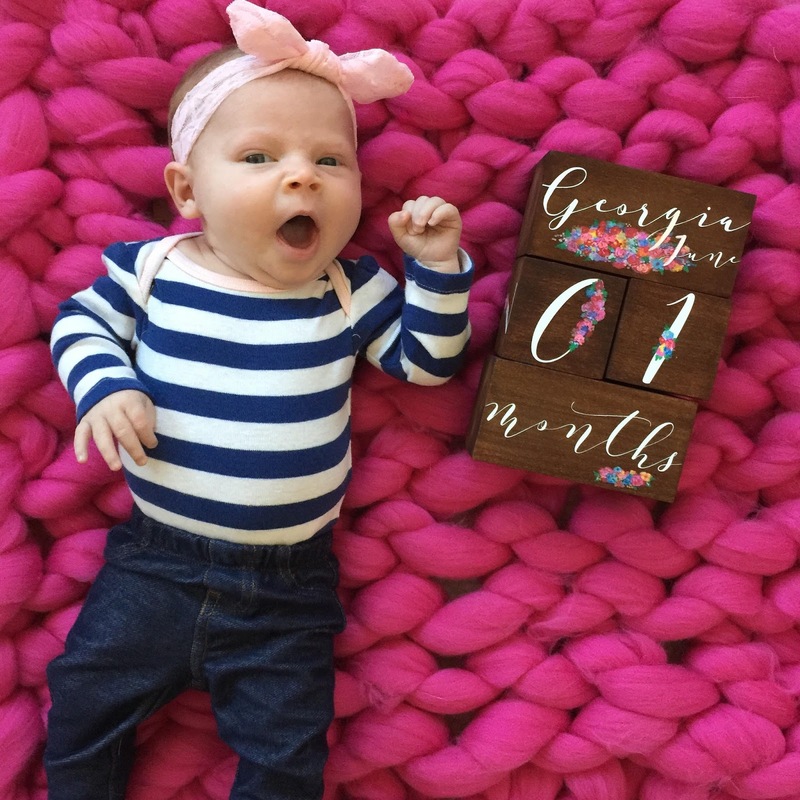 At her 1 month wellness appointment she was 9lbs 6oz (63 %) which is over a pound more than what she weighed at birth (8 lbs 2oz) and almost two pounds more than what she weighed when left the hospital (7lbs 10oz) so she is growing like a weed so far. She is also 22.5" (98th%) which is 1.5" more in length than she was at birth (21"). She's got a redish tint to her otherwise dark blonde hair, she's got quite the stork bite on the back of her neck too. Her eyes are blue and she's very alert and now looking at us in the face and responding to noises. This last month has been one like no other. Being Georgia's mama has been nothing short of amazing. She has challenged me in ways I have never been challenged and I've loved her in ways I didn't know was possible. Being a family of 3 (or 5 if you count the furbabies!) is the best. I love watching Joe love on her, it's the sweetest thing. I know we are both proud to be her parents and I'm so thankful that the journey that we took to get pregnant led us to her. She is just the cutest! I am so glad to hear everything is going well and I can't wait to see the pictures! Bowen had a reddish tint to his hair early on and I always wondered where in the world that came from but as he got older that went away. Oh how I love this, and yes those furbabies totally count. I loved reading all the sweet little things you take in while breastfeeding her <3 What a special month! I'm so glad everything is going well! That first month is such a blur. She really is beautiful, and I'm so happy breastfeeding is going well. It's seriously the best. Good for you for already being comfortable to breastfeed in public! Sounds like it has been such an easy transition into motherhood for you! awwww she is so adorable :) glad everything is going well.